Today 2,404 breweries competed for hardware and a moment in the spotlight in Denver, Colorado. A total of 8,496 brews from 49 States plus DC were thoughtfully evaluated over several days of blind judging. (Looking at you, Mississippi!) After the ceremonies, brewers from 280 medal winning breweries, including 31 first timers, were able to walk out with the gleaming medals hanging around their necks. The style with the most entries – 391 – was the newest style, Juicy or Hazy IPA, added to the competition this year. The category was swept by small breweries in the midwest. American Style IPA, the leader in entries for nearly two decades, only saw 311 entries. Some happy winners are coming home to the SF Bay Area. San Leandro’s 21st Amendment was awarded a bronze medal in the American Style Cream Ale category for El Sully. Peter B’s Brewpub of Monterey was honored for Tropical Maelstrom, a bronze in the American Style Fruit Beer division. Hermitage Brewing Co. of San Jose got the silver for Sour Cherry Sour, in the Fruited Wood and Barrel Aged Sour Beer Category. Corralitos Brewing Co. of Watsonville pulled the bronze in the Fruited Wood and Barrel Aged Sour Beer Category for Zoned AG Golden Raspberry. Santa Clara Valley Brewing brought home a silver to San Jose for a German Style Wheat Ale, Alviso Mills Hefeweizen. Alvarado Street Brewery and Grill of Monterey took a gold for Mai Tai PA in the International Style Pale Ale category. Its Salinas production brewery snagged a bronze in the Juicy or Hazy Imperial or Double IPA category for Contains No Juice. The Penske File earned Faction Brewing Co. of Alameda a bronze in the International Style Pale Ale category. Russian River Brewing Co. took a silver for STS Pils in the Kellerbier or Zwickelbier division. It was brewed in their Santa Rosa production brewery. State Room Brewery of San Rafael took a silver in the Light Lager category for Awesome Beer Rice Lager. Original Pattern Brewing Co. of Oakland brought home a silver medal in the Other Belgian Style Ale division for Call of the Void. SF’s Standard Deviant Brewing got the bronze in South German Style Hefeweizen for their Hefeweizen. A gold medal is going home to Drake’s Brewing Co. in San Leandro for Santa’s Brass, in the Wood and Barrel Aged Strong Beer category. 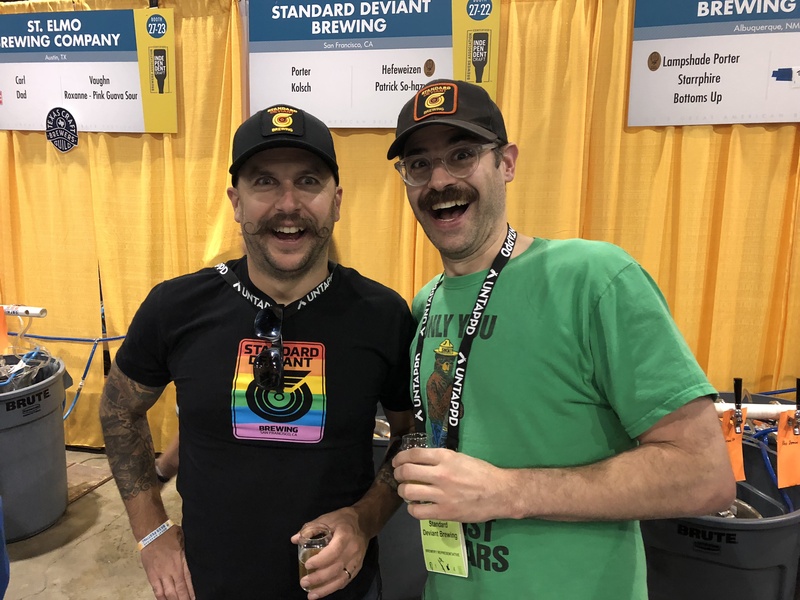 Brewer Paul Duatschek and co-founder Mark DeVito of Standard Deviant share that first time medalist feeling at their booth in the hall. Congrats to all the winners, near and far! There will be more coverage to follow.